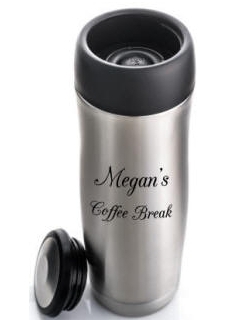 This large stainless steel travel mug holds 14 oz and features 360 degree drinking with it's unique push button open close feature. 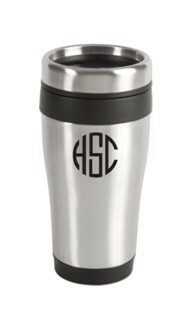 Keeps beverages hot or cold for up to 6 hours. 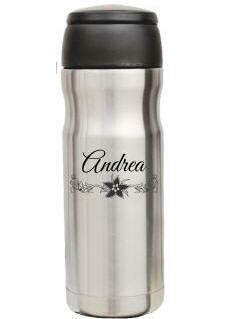 Personalize it for a welcome gift for many occasions. FREE personalization on 1 side. 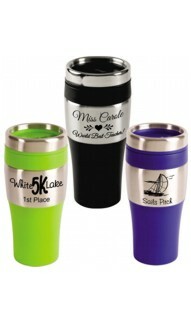 These sippy travel tumbler and straw travel are a very popular item. Our stainless steel sippy cup holds 16 oz. of your favorite cool beverage. It contains a plastic interior, screw on plastic lid and a plastic straw. Keep 16 ounces of your best beverage hot with this extra large travel mug. 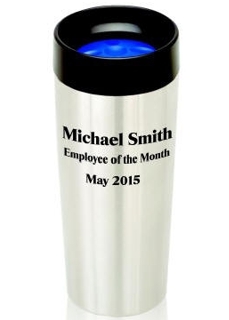 We can personalize on either side of the mug with laser engraving. Makes great gifts for your wedding party or corporate gifts. An original design that keeps coffee hot longer than any other mug and is absolutely leak and drip proof with the final top on. Comfortably holds 13 ounces. BPA free. 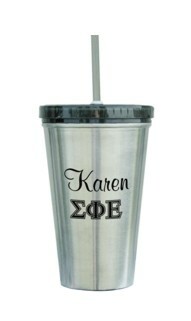 We can personalize with a name or any desired text of your choice. This stylish mug holds 16 oz. and has a BPA free plastic interior. Features a comfort grip bottom, non skid base and spill proof thumb slide lid. This travel mug fits most automobile cup holders. Do not microwave or put in the dishwasher. Available in three fabulous colors: Black, Blue and Lime. This Classic shaped 16 oz. 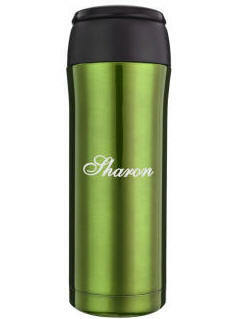 double wall insulated travel tumbler with stainless steel exterior and BPA-Free Polypropylene Plastic interior. With a Black color band along the top with matching color thumb slide plastic lid. Hand wash only. Not dishwasher safe. Do not microwave. A mug designed just for her! 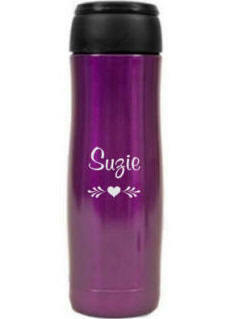 She'll love drinking her coffee out of this purple mug on her way to work, school or simply around the house. We can personalize with a name or any other desired text. Insulated and leak proof.